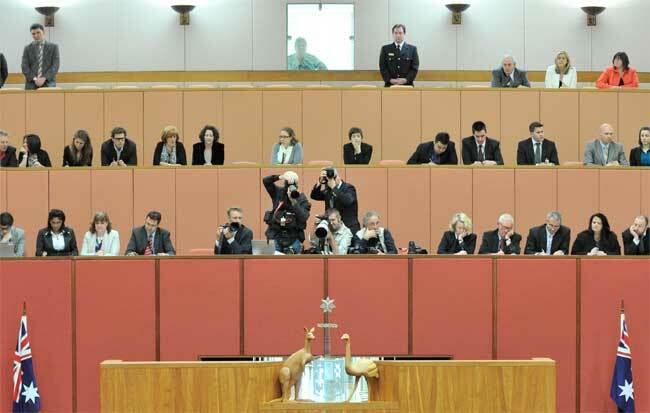 The press gallery in the Senate chamber. MARGO: Everyone know journos can’t keep a secret, but they’ve somehow managed to keep the list of Federal Press Gallery members secret from the general public. Until now. As regular @NoFibs readers know, I FOI’d the list of Press Gallery members when I realised, much to my surprise, that it was secret. Press Gallery President David Speers is now seeking gallery members’ permission to make the list public. @David_Speers, any developments on membership criteria? @margokingston1 still working on that too. Plan to include criteria on the new website. @David_Speers, brilliant. Congratulations, David. Big reforms on your watch. David’s consultations have alerted some members to its secrecy, and, lucky for us, one of them thinks the secrecy so silly I’ve had a leak. So here is the 2012 list with contact details of non-office bearers deleted. The public will get the latest list online either via FOI or the new PG website, whichever comes first. Federal Press Gallery list revealed http://t.co/gzuMjdmmhh via @NoFibs #auspol #ausmedia First time publicly listed anywhere, worth saving! Good news, Margo. At least one member finally saw sense. Never realised there were so many of them though. You would think with such a large Press Gallery membership that at least one or two would get the stories right, occasionally. i would much rather have their addresses. Lord help us; so many of them, you would think they would make a better fist of it! A few there would be looking down a short barrel of retirement. Unless the “club” has already promised someone else IA should be there. Interesting that Bernard Keane only one from Crikey considering his articles are posted in Murdoch empire’s BUSINESS SPECTATOR sold to them by ABC money bags ALAN KOHLER…and BERNARD KEANE HAS BEEN CALLING FOR A BROADENING OF THE GST etc.